Purchasing a portable ice maker might seem to be a straightforward task as long as you don’t set foot on the market. Varying in size, price and another set of features, today’s market is over-flooded with a wide range of models. As a result, it isn’t easy – for almost any customer – to make an ideal purchase without prior research. So, if you’re looking for the best portable ice maker, you’ve just landed at the right place. After thorough research along with a handful of exploration, we’ve come up with 7 best ice makers for a home bar and not only. 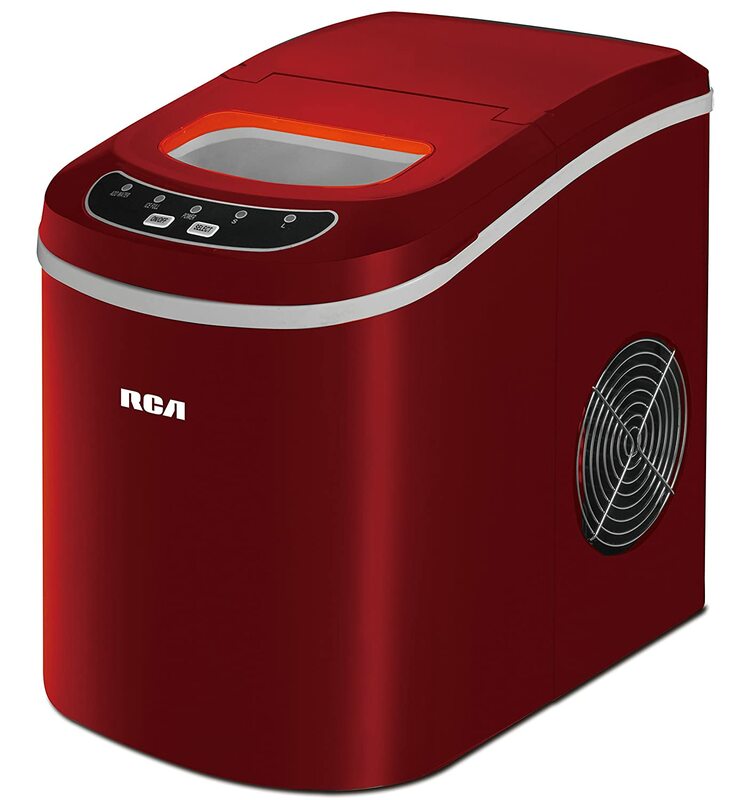 If you’re looking for a portable ice maker, have a look at the NewAir AI-100CB. Stylish in design with a compact shape, this unit requires no extra storage space in your kitchen. The overall weight of this ice maker is nothing more than 24.3lbs which makes it easy to carry from one place to the other. Starting with the powerful compressor, it is capable of producing 28lbs of ice per day. It means that you don’t have to turn towards your local liquor shop, for buying a bag of ice, after getting your hands on this beauty. The AI-100CB is easy to operate as once it arrives at your doorstep, you just have to plug it in before adding some water. Afterward, it will come up with your favorite ice in from 6-15 minutes. As compared to other such products, it requires no extra installation which makes it customer-friendly purchase. On the front of this machine is a select button which lets you choose from small, medium and large sized ice cubes. There is also a power button and for the sake of its users, this machine comes up with a couple of indicator lights. One of them notifies when the ice is ready and as per the other one, it indicates when water should be added to this machine. One minor drawback regarding this ice maker has got to be the fact that it does not make crushed ice. If you’re a party lover, who likes to fill his/her beverages with crushed ice, you might have a problem with this particular machine. Featuring a wide range of features, the NewAir AI-100CB is one of the best portable ice makers which you could purchase. Designed with a sturdy compressor, this machine is extremely easy to operate even for a newbie. And when it has a decent storage space, it can be a great addition to your kitchen, on the boat and other such places. 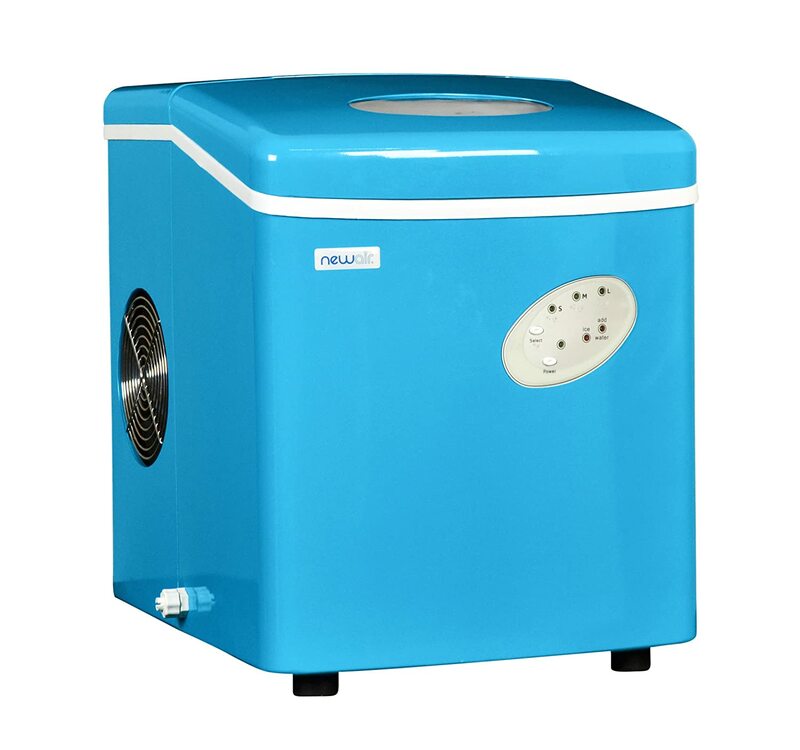 The Della Portable Top Load Electric Ice Maker is an efficient machine which beliefs in a swift operation. Incorporating a stylish combo of stainless steel + black design, it can serve a fresh batch of ice in as low as just 6 minutes. There aren’t many machines in the market with a faster serving time and that’s what makes this unit the best ice maker for a home bar. It comes in a compact shape which makes it easy to place on your kitchen’s countertop or other compact places. This machine weighs as low as just 21lbs which make it a viable purchase for every kitchen. Even with such a small size, it won’t affect the overall performance of this machine as with a Della Portable Top Ice Maker at your side, you can enjoy up to 26lbs of ice every day. Coming towards the cube sizes, you can acquire ice cubes in two different sizes from this ice maker. You can select your ideal cube sizes with the help of push button controls which are available on top of this unit. Besides, the manufacturer has integrated the Della Portable with a couple of LED indicator lights which informs the users of when to add water or remove ice basket from this machine. The Della Portable Top Load Electric Ice Maker comes with a 30-day money back guarantee so if anything goes wrong within the specified time period, customers can always replace it without any hindrance. 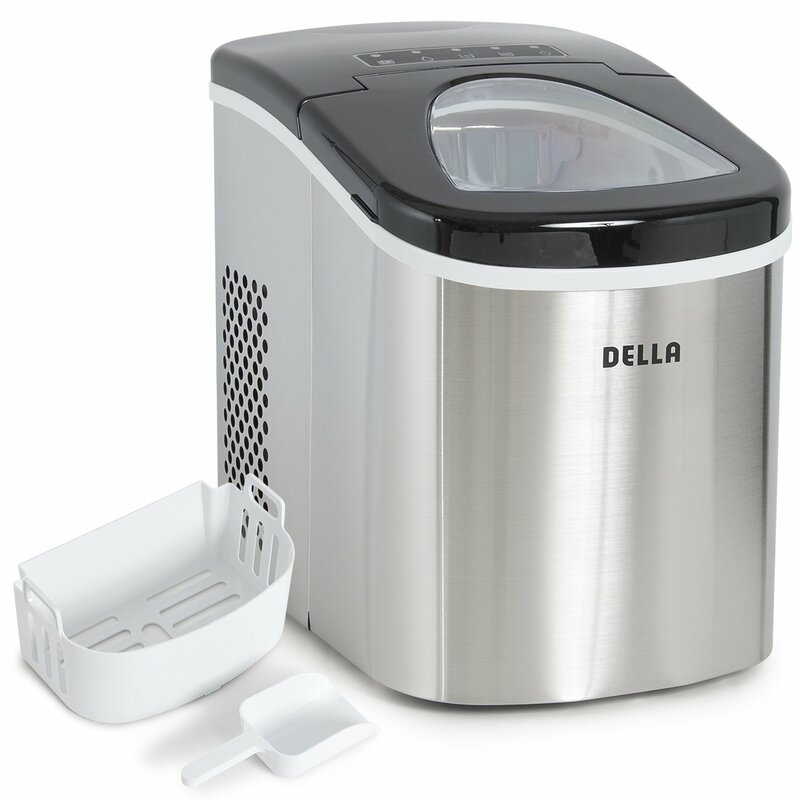 Finally, customers should keep this thing in mind that regardless of its small size, the Della Portable isn’t the quietest working ice makers in today’s market. It will produce some noise while working but other than that, it is a top-rated product. Available at an affordable price, the Delta Portable Top Load Ice Maker is an ideal purchase for the budget-oriented customers. In addition to its compact design, it has a speedy work cycle and when it is lightweight, you don’t require previous experience as well thanks to its user-friendly controls. 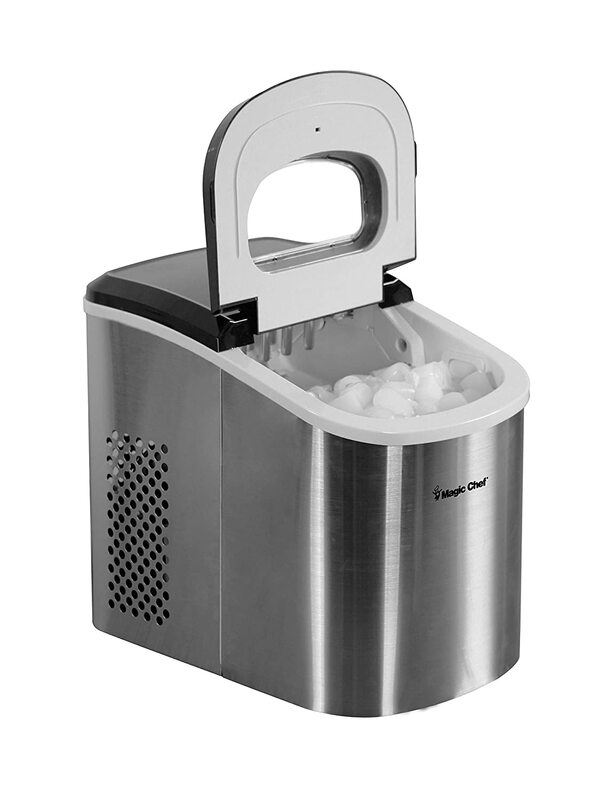 The EdgeStar Portable Ice Maker is a high-quality machine available in three different colors. In addition to a stylish black exterior, customers can purchase it in modish red or even sophisticated gray design. All of these designs are quite attractive which will be a decent addition to almost any kind of premises. Featuring a sleek design, this is one of the best countertop ice makers for the customer’s convenience. This machine can produce up to 28lbs of ice within a 24-hour time period which, as compared to other such makers, is a much higher value. Once you pour water into this machine, it is capable of storing 2.5lbs of ice within its storage basket. Even when you take out the ice, you don’t have to drain out the rest of the water as with the passage of time, the machine will turn all of it into ice as well. EdgeStar has provided controls on the front of this machine which lets you choose from 3 different ice cube sizes. There is also a power button along with a couple of indicator lights. When the ‘’Add Water’’ light notifies the owner that it’s time to fill up this machine, the other ‘’Ice Full’’ light indicates that the ice is ready for usage. Furthermore, this Portable Ice Maker requires no drainage which makes it a valuable accessory to take out with you on almost any outdoor trip. This machine is susceptible to producing a bit of noise during its regular operation. So customers should keep that in mind while making this purchase. 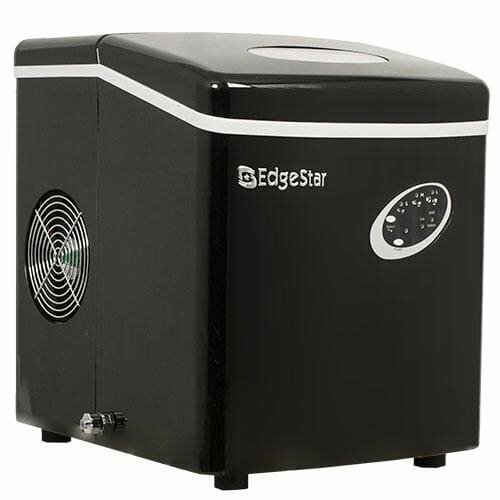 The EdgeStar Portable Ice Maker is an ideal purchase for all those customers who’re vying this equipment for a smaller office, boat or kitchen countertop. This machine produces a decent amount of ice per day and thanks to its intuitive controls, everyone can operate it without any hindrance. The Compact Ice Maker from Igloo is rated very highly in the ice maker reviews. This is due to the fact that even when it is available at a reasonable price, this ice maker has got all the features which one could expect from a high-end model. Featuring compact dimensions, the unit comes in stylish red design at a very affordable price. Once you pour water into this machine, it is capable of producing ice in just 6 minutes. Moreover, it is quite a versatile ice maker which lets you choose from two different ice sizes. The overall weight of this ice maker is just under 22 pounds which make it easy to place on the countertop of your kitchen. When it can produce up to 26lbs per day, it has the capacity of storing 1.5lbs of ice. Onto the controls. This machine comes integrated with easy to use LED controls which are a big plus for customers looking to use it on a consistent basis. With their help, you can turn on/off the machine and change the size of cubes as per your needs. Another thing which is present in this machine, like most of its competitors, are the two indicator lights. Having said that, the size of this machine restricts its usage to domestic needs. When it can produce no more than 26lbs of ice without 24 hours period, along with 1 and a half pound storage capacity, that might not be enough for some bigger social gatherings. The Compact Ice Maker is ideal for all those customers who’re looking to purchase a model for their domestic needs. With a decent production value along with LED controls, it can serve the needs of its owner in an imperious manner. The Magic Chef MCIMM22ST Ice Maker is an elegant machine which can be installed almost anywhere in the kitchen. Weighing just under 18lbs, this is one of the lightest units in this regard and when it features stainless steel in its construction, one can use this ice maker for a greater duration of time. Apart from using it for your domestic needs, this is an ideal machine for all the outdoor endeavors. In 1 cycle, it can produce up to 9 cubes of ice which is a staggering feature as compared to the majority of other ice makers which you could purchase. Moreover, it is fast enough to produce a fresh batch of ice in 7 minutes. The Magic Chef comes with a see-thru window which allows you to see the entire operation, in which water turns into eyes, with a crystal clear view. Another thing which is quite beneficial in this purchase is that it can produce a decent 27lbs of ice per day. For serving the needs of different types of customers, this machine allows the option to select from two different ice cube sizes. There is no point in purchasing an ice maker if it isn’t easy to operate. However, the Magic Chef MCIM22ST is extremely easy to use as a couple of buttons is all you need to operate this ice maker. One just has to remove the lid before pouring water into this machine and it will come up with the desired product in a very short duration of time. This Portable Ice Maker doesn’t possess a sufficient space when it comes to storing ice. So once it produces the ice, you have to use it or store in a separate deep freezer. Otherwise, it will melt and convert into ice (again) with the passage of time. If you’re looking to purchase a multi-purpose ice maker, one which can be used in the home as well as other outdoor gatherings, the Magic Chef MCIM22ST is all you need. It is a lightweight unit which is easy to transport and it is incredibly fast when it comes to producing ice at regular intervals. Whether you’ve to deal with guests who arrive without prior information or are going to need ice in case of a party, the Hamilton Beach Portable Ice Maker presents a viable solution. Featuring a sleek design, this machine comes in a stylish black color. At a time when most of the other machines are content on just two indicator lights, this ice maker has gone one step ahead providing its users with 3 indicator lights. Two of them perform regular service, which is to inform about a full basket of ice and when to add water but as per the third one, it informs the owner of this machine that this unit is making ice. This unit just takes 6 to 8 minutes while producing a fresh batch of ice and during 24 hours period, it can come up with up to 25lbs of ice. The overall width of this ice maker is just 13 inches and with a length of 14 inches, you can place it wherever you want in your kitchen or in the outdoor environment. One thing which impressed us most about this machine is its compressor. If you’ve used some kind of ice makers in the past, you will testify to the fact that a large number of them produces a great deal of noise during their operation. But thankfully, there is no such case with the Hamilton Beach Portable Ice Maker because even though the compressor is quite powerful, it still performs its duties in a quiet manner. Regarding the minor drawbacks which this machine possesses, you might have noticed the fact that at a time when other machines in this list are producing up to 28lbs of ice per day, the Hamilton Beach is content on 25lbs. Even though this is a minor difference, it is still worth mentioning. 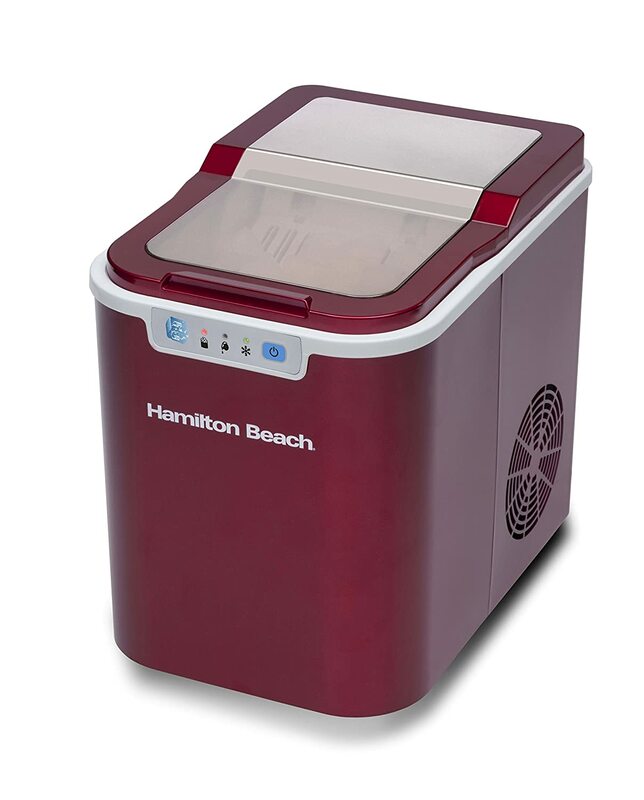 The Hamilton Beach Portable Ice Maker has got all that features which one could expect from the best ice cube maker. With a quiet yet powerful compressor, this machine makes use of 3 indicator lights along with an incredible storing ability. The Gourmia GI110 Ice Maker is designed for home usage. As evident from the name of this unit, this is a portable machine which requires no extra space in your kitchen. It weighs just under 21.5lbs which assists the owner of this machine while transporting it from one place to the other. Even with such a small size, the Gourmia G110 is capable of performing a wide range of tasks without any hindrance. Once it arrives at your doorstep, it requires no installation. You just have to plug in this ice maker, pour in some water and BINGO! It will produce 9 pieces of ice in an incredible 10 minute time. The GI110 is capable of producing just above 26lbs of ice during a 24 hour time span and for the sake of portability, it can store up to 2lbs of ice at a time. Hence, you can use it for parties, on the road trips and other for other such exciting tasks. Even if you leave the ice unattended, it will turn into water (obviously) before turning back into ice at the end of next session. Users can decide from 3 different cube sizes which this machine offers and with a removable tray, this machine is pretty easy to clean. Also present in this machine is an auto start timer so you can decide pre-hand when this machine should start its operation. Finally, the Gourmia GI110 machine comes with a money back guarantee so if anything doesn’t work quite well on its arrival, you can easily return it for a full refund. Despite the fact that this is an incredible purchase at such a decent price tag, the Gourmia GI110 is still not a perfect product. At the end of every production cycle, it produces a bit of noise in the form of ice cubes rattling against each other. 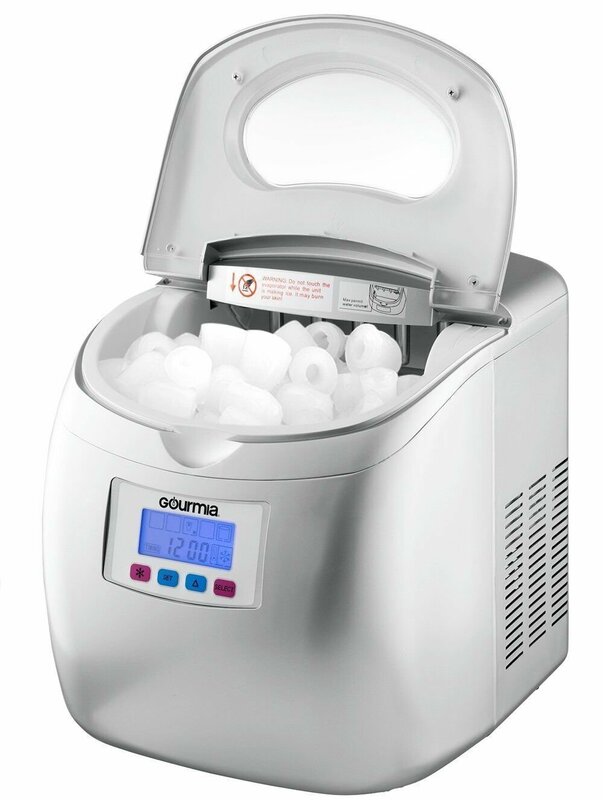 If you’re looking for a portable ice maker for a limited space, the Gourmia GI110 Compact Portable Electric Ice Maker is worth a try. In addition to its hi-fi set of features, the fact that it comes with a money back guarantee gives you an idea about the superior quality of this unit. When it comes to the portable ice maker, there aren’t much better products available in the market than the NewAir AI-100CB Portable Ice Maker. Coming from a reputed brand, this unit has the ability to produce as high as up to 28lbs of ice per day. Such kind of capacity is more than enough to deal with almost any social gathering. Combine it with its powerful compressor along with a fast operation time and this machine can serve your needs in a flawless manner. When it comes to purchasing a portable ice maker, one has to keep a number of things in mind before making this purchase. Starting with the size of this machine, you should consider its weight, production capacity, speed, ease of use and other such important features. There is no point in purchasing a portable ice maker if it isn’t portable. Yes, this machine should be compact enough so that it shouldn’t require extra storage space in your kitchens, boats, and RV etc. If you’ve to transfer this purchase from one place to another on a frequent basis, purchase the best ice ball maker which is lighter in weight. Any such machine will facilitate its owner in the future as he or she should be able to carry it in a comfortable manner. For more often than not, you will be using this machine when there is a party going on in the surroundings or in the case of a sudden arrival of guests. When both these scenarios cannot afford any kind of delay, the best portable ice maker should be capable of producing ice within 6-10 minutes period. Measured in pounds/day, the production capacity of any portable ice maker should be good enough to accommodate a large number of guests during a 24 hour period. This machine should be easy to use for both, elders and children alike. It should have a number of buttons which can be easily operated. In addition, there shouldn’t be any complex mechanism by which you have to pour water into the ice maker as any such thing won’t be feasible for a longer run. As compared to the deep freezers, a portable ice maker is quite inexpensive. But having said that, price does play a key role in a quality of this product. If you’re going to place this unit on the countertop of your kitchen, it should look pleasing to the eyes. So for all such customers, they should purchase an ice maker with a stylish exterior. Nowadays, manufacturers have introduced such machines which let you choose the most viable cube size as per your personal choice. Normally, there are two to three options available in every portable ice maker in this regard so if your machine is going to cater a large number of guests, have a look at this particular feature.